The rapid adoption of cloud infrastructure and software services is driving a tectonic shift in enterprise IT. That shift is causing organizations to reexamine their data warehousing technology, seeking solutions that are more than just conventional software repackaged in the cloud. Many data warehouses deployed today were developed during the 1980s and were built for on-premises data centers typical of the time. These solutions still exist, including the availability of “cloud-washed” versions. Both options typically involve upfront licensing charges to buy and to maintain these legacy data warehouses. Yet, neither legacy data warehouses (0r current generation data lakes based on Hadoop) can elastically scale up, down, or suspend as needed to meet the continuously varying demands of today’s enterprises. Many EDW implementations are not mission critical today (as compared to enterprise applications). As more data becomes available through social media or Internet of Things (IOT) applications, businesses need access to much larger volumes of data and they will want access to it earlier in the data pipeline. Traditional DWs contain aggregations and are used for doing trend analysis, analyzing data over a period of time to make strategic, rather than tactical decisions. They are not architected to handle this new influx of raw data in a cost-effective manner. By starting your cloud journey with the EDW, you reduce risk (by going to a more flexible architecture) while getting your team early exposure to working with cloud services. When moving to the cloud, you want to show incremental success and don’t want to add a lot of unnecessary risks. It’s simple to keep running your existing EDW in parallel with your new cloud DW, giving you a built-in fall-back plan for the early stages. Or you may decide to start with a small data mart as a pilot project. Some of our customers spent a lot years ago on a data warehouse appliance that is now outdated technologically. And the renewal costs to keep that tech going are coming due. If they re-invest another huge sum of money, this will delay them getting to the cloud by another 4-5 years, putting them behind their competition. Rather than outlaying a large capital expenditure to extend the life of the older technology, it may make better sense to move to the cloud. The cloud offers a utility-based model, allowing you to pay for what you use and when you use it, as opposed to what you think you are going to need 2-3 years in the future. As a result, not only is the cost of entry lower, but you are not risking a huge sum of money to make the move. Will you ever have fewer data to worry about in your business? If you plan on being successful, I don’t think so. Many organizations are looking at new and different ways to manage and analyze ever-increasing volumes of data coming in various formats from multiple sources (such as semi-structured weblogs). Your current on-premises EDW was not designed for this kind of workload or data. If you are considering changing infrastructure platforms to accommodate it, why not select tools that were built for today’s modern data challenges instead of legacy-based architectures? Moving to the cloud also gives you the opportunity to consolidate operations and streamline business processes. There are some new analytic paradigms happening in the cloud (such as machine learning). Cloud-based platforms allow you to work with both detailed and aggregated data at scales never imaged. Need to run a complex analytic job with a 256-node Massively Parallel Processing (MPP) cluster for an hour, and then shut it down? No problem. Can your platform support a thousand users without concurrency issues? How would that change your business if it could dynamically adjust to handle those new demands? 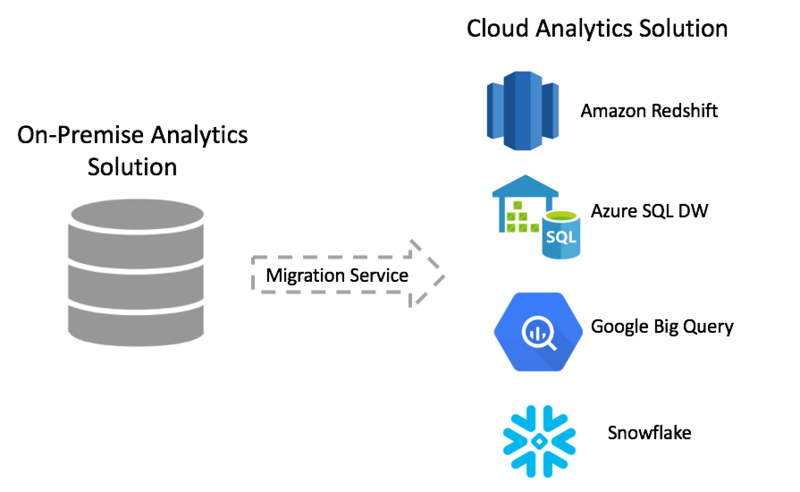 Looking for a EDW/BI cloud migration?